Bathing suits in hand we headed to the lobby to catch out bus for a day at the Blue Lagoon, a warm geothermal seawater outdoor pool surrounded by a lava field. 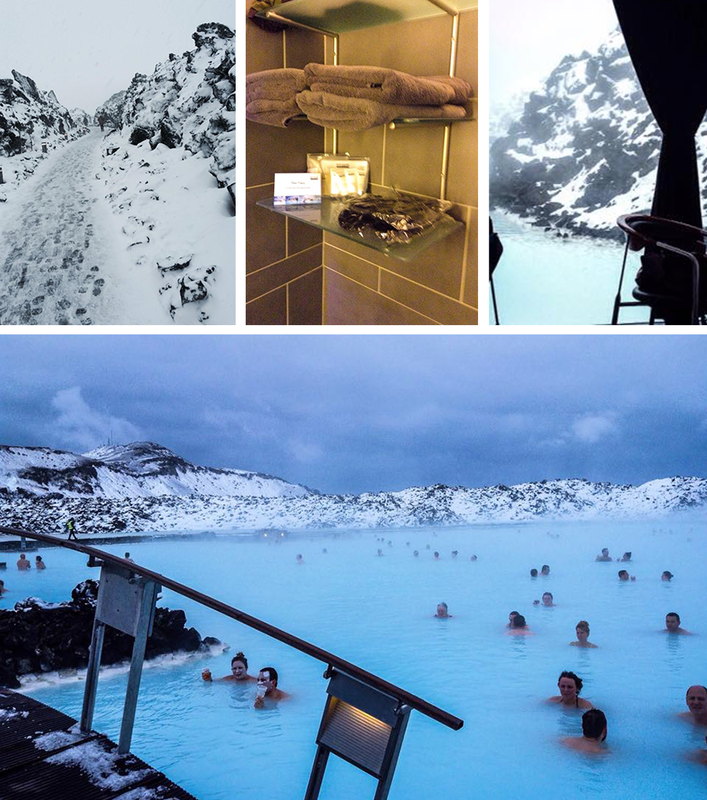 This is considered a "must-do" activity for all visitors to Iceland. As we waited, we got to talking to another couple, he's originally from Tenesee, she's from Rio, Brazil. Coincidentally, he has a lot in common with Brett. So a lively conversation ensued. As we chatted the bus arrived. Off we go, but the bus is going to the Golden Circle. No need to be concerned. Five minutes later, when we asked about the bus to the Blue Lagoon. We were told that the bus that just went on its merry way was the one we wanted. Plan B- take a cab. Maybe not at 19,738.50 ISK ($150.00 usd). Plan C- Wait for the 9:30 bus and get to the lagoon late. I'm sure you can guess which one we did! Upon arrival, a young blond Icelandic women greeted us and took us to our changing room. Included in our room: bathrobe, towel, and a Blue Lagoon do it your self spa kit. Off we go to the lounge to have water and fruit. It's recommended that you drink large amounts of water because of the minerals in the pool. On the docket for the day. Three hours in the pool, a 30 minute massage in the pool and lunch at the Lava restaurant. We were reminded several times at both the hotel and spa that the Lava's chef had recently won a prestigious world cooking competition and we were in for a treat! I wouldn't do the day in the pool or the lunch justice by trying to describe them. So, I'll say, if you plan on visiting Iceland, it is a must do! If Iceland never crossed your mind as a place you would visit, give it a second and a third look! We are enjoying it more than we ever thought we would.